Entering rainy season, Jakarta Fire Handling and Rescue (Gulkarmat) Dept. prepares its personnel and equipment. It is done to anticipate inundation and flood that could be happened in Jakarta.
" All equipment are in a good condition and distributed in five Jakarta regions"
Besides preparing personnel, Jakarta Gulkarmat Dept. 's Rescue Division Head, Muchtar Zakaria informed, his side also prepares 40 fiber boats, 133 rubber boats, 102 outboard motors, 541 buoys, 204 helmets, 41 scuba units, 427 paddles, and others. 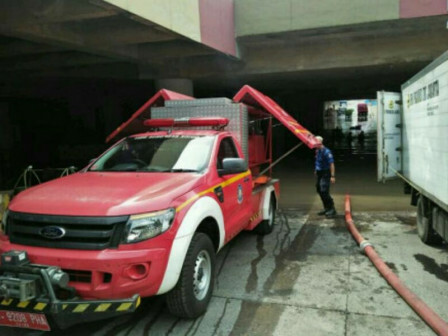 The others are 78 fire trucks equipped with portable pumps; 35 pumps with capacity 10,000 liters; 137 pumps with capacity 4,000 liters and 65 pumps with capacity 2,500 liters. "All equipment are in a good condition and distributed in five Jakarta regions," he conveyed, Wednesday (11/7). He added, there will be also additional 8 pump trucks this year. Not only preparing equipment, his side also prepares personnel to anticipate inundation. "Around 750-800 personnel in total with around 150-170 personnel on duty in each Jakarta regions," he said. Jakarta Gulkarmat Dept. Head, Subejo stated, personnel and equipment preparation is done to anticipate inundation and flood during this rainy season. "We are also prepared for one call duty in some regions prone to flood such as Gang Arus Cawang, Petogogan, underpass near Gandhi Memorial International School, and others," he mentioned.